is that wisdom preserves the life of its owner. Along with trying to understand how to store up treasures in heaven (or maybe because of it), I’m a repeat visitor to thinking about education: how it should be done, to what end, by whom, for whom, when, with what content, etc. It’s a natural go-to topic for a homeschooling father who is also finishing an MA by distance. A few years ago, I had a paradigm shift in how I view education. I’ve always been very pro homeschooling for its manifold benefits, both scholastic and otherwise. I’ve always known it was a gift I wanted to give my kids. But I had little reason higher than personal taste to prefer homeschooling to standard schooling. Then I met my wife. My wife was homeschooled the whole way. Yes, by that I mean that she was homeschooled through primary and secondary school. But I also mean something more. Not only was my wife homeschooled right through year twelve, but she also did her entire tertiary degree without ever stepping foot on campus. Or rather, not until she received her diploma. Contrast that with me. I was never homeschooled: I went to a private day care; I went to a private preschool; I attended Christian and secular primary and secondary schools; I attended Christian and secular institutions for my BA; and for my MA work I did exactly the same. A number of these institutions are brand names – Wheaton, Oxford, Middlebury, University of Chicago, Regent – institutions known for their academic and intellectual rigour. But I can tell you, between my wife and I, who had the better education. Hint: it wasn’t me. No question: my education was good, but hands down, my wife wins the contest (for which I abundantly thank my in-laws). Sure, her maths are basic, she did almost no science, and she doesn’t know how to format a research paper according to any manual of style. However, she is exceedingly well and widely read, both intellectually confident and humble, perpetually self-motivated to explore topics of interest and fill gaps in her knowledge, discriminating in her tastes, and wise. What more could you want from a good education! Once I met my wife, I had a paradigm shift. A simple one, but with big consequences: the institutions, the diplomas, the educational rights-of-passage, these mean nothing if education, actual education, is not happening. Less than nothing, really — they mean a tremendous waste of God-given time and resources, for everyone involved. We, each of us, have one life to live. One only. Which is all the reason any of us need to be wise in our educational choices. All the reason any of us need not to kill time fitting into the educational status quo. About half a year ago, a young friend was trying to decide whether to go to a certain institution for a graduate diploma in missions before she headed off to the mission field. I encouraged her to consider skipping grad school and to head to the field directly. That serious conversation prompted me to create the playful decision tree below. This is not a serious tool, but maybe, just maybe, it will get someone thinking more seriously about enrolment in tertiary education: undergrad, grad, or postgrad. Any form of tertiary education is a big commitment of time and money. Please understand, I am not saying “don’t go”, but I am saying “don’t make ‘yes’ the default”. There are plenty of reasons why staying home or doing something else would give you a far better education for life. And you may be surprised to know that there are hosts of people who have taken the road (slightly) less travelled and lived to thank themselves. Were they all alive, you could ask each of them personally. Or, you could ask my wife. She may just inspire you to shift your paradigm too. 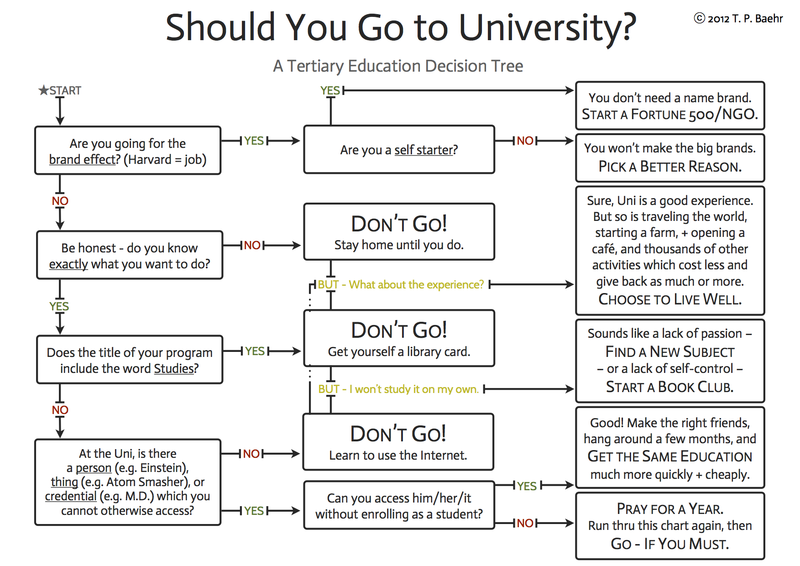 Download the Tertiary Education Decision Tree as a pdf.